play NASA, we are becoming aware of just how critical women have been throughout the development of our nation's space program. 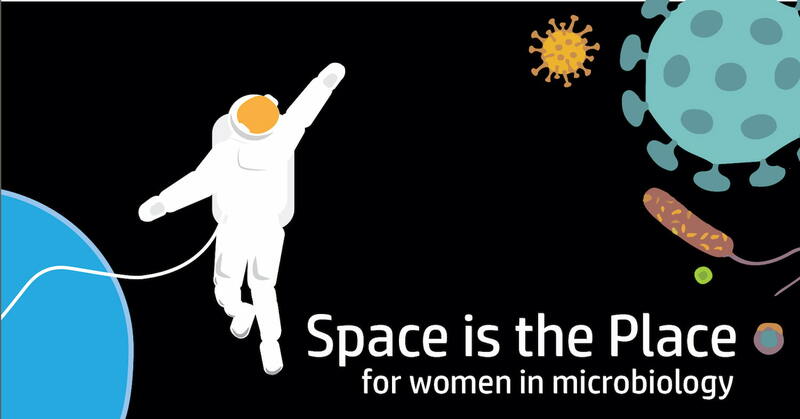 Not only in the fields of mathematics, computing, engineering, and aeronautics, women at NASA have also been a vital part of biological research. At critical intersections of space and microcosm exploration, there have been women scientists at the cutting edge. Women scientists were a part of NASA's earliest days, despite professional and cultural obstacles. During the preparations for the first Moon landing in the 1960s, NASA prepared for possible biological back-contamination of lunar samples brought back by astronauts. There were no protocols for handling or containing these samples, so NASA effectively created the field of astrobiology when it hired a team of microbiologists to write up the protocols as well as design the Lunar Receiving Laboratory. One of these microbiologists was Dr. Millicent "Mimi" Goldschmidt, a young scientist from Pennsylvania. Her responsibility included not only designing the areas and protocols for testing lunar samples for microorganisms, she also trained Neil Armstrong and Buzz Aldrin in the aseptic techniques they would need to collect the samples on the Moon. Mimi's legacy can be seen in today's field of astrobiology. Dr. Kate Rubins became the 60th woman to fly in space when she joined the International Space Station (ISS) team in 2016. Also a microbiologist, Dr. Rubins studied the effects of low gravity on a variety of microorganisms, including the impact on genes. She became the first person to sequence DNA in space. We think Mimi would be proud to hear about Zena Cardman, a member of the 2017 astronaut candidate program, who brings her expertise in microorganisms in subsurface environments (caves and deep sea sediments), and may one day help find life in similar environments on other planets. Not all astrobiology involves leaving our planet; many Earth-bound NASA scientists are making contributions that help us prepare to explore beyond the Solar System. Dr. Sharmila Bhattacharya is the Lead Scientist and Principal Investigator of BioSentinel mission, which will explore the effect of space radiation on Earth biology. This is vital research if human ever hope to travel to distant planets safely. Dr. Melissa Floyd, a research microbiologist, is designing a tool that will allow astronauts to sample and identify evidence of one-celled organisms in a small, efficient device. Her invention, FISHBot, will one day be a component of a Mars rover or be deployable as an independent robot. Dr. Natalie Leys is the Principal Investigator of BASE-A, the ISS-based study of the effects of microgravity on bacteria. Dr. Erica Hartmann led the team that explored the microbiome of the ISS, identifying strains of bacteria found throughout the ISS. These are just a few of the women leading the way in astrobiology at NASA and beyond. We have come a long way: From the days women had to fight for their right to an education, we are now about to experience the first all-female space walk under the direction of the first female chief flight director. What a wonderful way to celebrate Women's History Month!